As more details emerge about the severe tornadoes that engulfed parts of Alabama over the weekend, the stories of miraculous survival continue to trickle in. One such story features an unnamed woman, who was at home with her husband and young niece and nephew when the tornado struck. “I looked outside and I saw my horse running and the wind blowing,” she said, noting that it was only when she spotted her horse “panicking,” that she realized some fearsome weather was heading their way. “That’s when my husband asked me what was wrong and I said, ‘I think it’s a tornado,'” she added. Immediately, the woman said her husband ordered the whole family to get into the bathtub — a common safety measure for those without a storm shelter. Next door, a family home was absolutely flattened by the tornado. The woman also noted that she had heard the family’s son survived by “holding onto the couch” as the tornado ripped through the house. Other footage emerging on social media depicts emotional reunions between family members who were feared dead as a result of the brutal twisters. Which area was hit the worst? 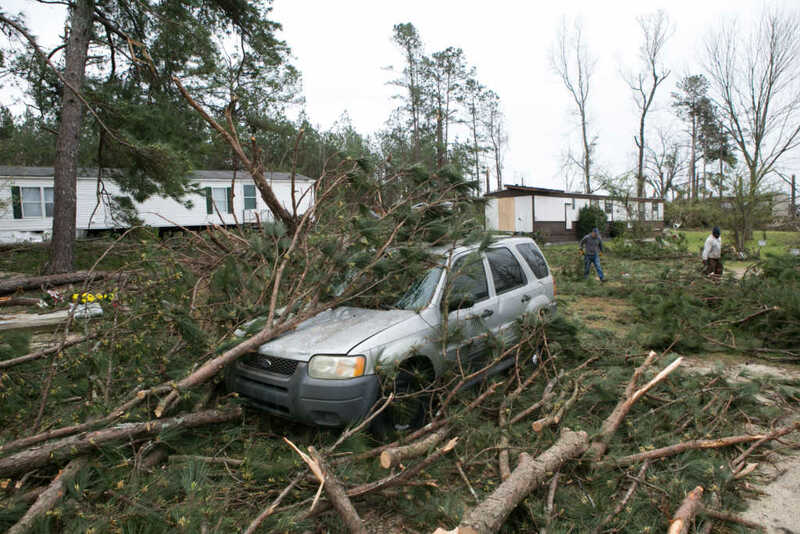 Beauregard and the surrounding areas along the Alabama-Georgia border got hit the hardest by a series of swirling tornadoes, which ripped up everything in their path. In Talbotton, Georgia, at least 15 buildings were leveled to the ground. The aerial scenes from Beauregard are simply horrible. According to the BBC, one of the dead in Beauregard was an 8-year old girl. “We’ve never had a mass fatality situation, that I can remember, like this in my lifetime,” Lee County coroner Bill Harris said, as reported by WBRC-TV. President Trump announced in a tweet Monday morning that he had directed FEMA to “give the A Plus treatment” to Alabama as it begins to rebuild after this devastating event. Do pray for all those caught up in these fierce tornados.